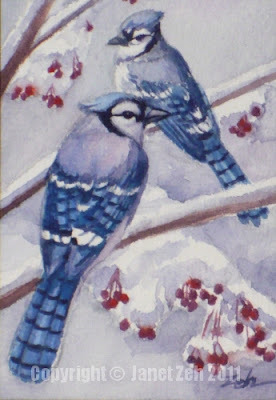 Two Blue Jays, sit in my crabapple tree on a snowy morning. The crabapples are tart and frozen, but the birds still appreciate them when food is scarce. More snow is expected for the next couple of days, so I've made sure the feeder is filled too. Thanks for all the suggestions coming in here and on Facebook for birds to paint and you'll be seeing them posted as they're completed. This one is 2-1/2 x 3-1/2 inches in a 5"x7" mat. 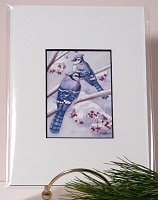 You can see close-up images in my Etsy listing: Blue Jays in a Snowy Crabapple Tree. Thanks for stopping by and if you're in a snowy or cold locale, stay warm! Nice post, Thanks for sharing the original painting.